Bees make the news a lot these days, probably more than they have since Africanized honey bees first entered the United States in 1990 and every apiphobe’s worst nightmares about bees. (Decent links are here, plus a map and a summary of what they are.) This time, the publicity comes because of Colony Collapse Disorder. It came along just about a year after I subscribed to the American Bee Journal, which is published by beekeeping supplier Dadant. So, here is an amusing link about CCD, which in turn links to Haagen-Dazs’ http://www.helpthehoneybees.com. It’s at the self-deprecatingly named Treehugger.com. And here are some beekeeper jokes. A quick entry to update, which I will elaborate on later this week. So, we have requeened, and the new queen seems to be working out. On July 9, Helen and I found the queen in South and confined her to a babyfood jar. We put a frame of brood and eggs from North in South, and closed up the hives. Then we ceremoniously euthanized her and buried her in one of the restaurant’s flower gardens. The queen arrived, with attendants, on July 10, and Helen and I installed her in the morning on July 11. South was as mad as I’ve ever seen it, either because of the weather, which was lousy, or because they already were feeling under stress because of being without a leader. Helen checked on the queen on Sunday, and she wasn’t released yet. But when we came back on Sunday (July 20) all the bees seemed to be doing well. The new queen was out, and laying in South. North is doing great, and is almost has the super full, so we added a second. A short note…My fears about the South hive really have gotten to a critical point. After consulting with a couple beekeepers I’ve been in touch with, including Larry Krengel, who teaches a class via McHenry County College that I flitted into briefly this spring, I’ve concluded that all this lack of activity in South is the fault not of overactive workers, but an underactive queen. In my hives in the past I hadn’t run into this much, and remember it only vaguely from my time with Dr. Fitzsimmons. So because of her early good work and my hopes to keep her, I ignored the signs. Now, however, the hive has come to a critical pass, and I’ve decided to requeen. I’ll be doing that later this week, and posting links, etc. 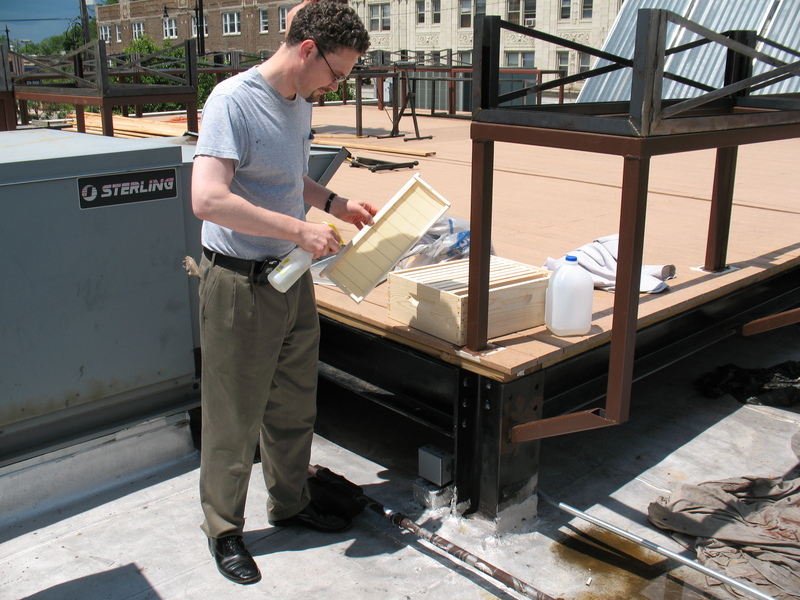 Spraying a frame of foundation with sugar water to make the bees more interested in adding wax to it. Just a quick note to say that South still hasn’t gotten its act together entirely, but they are now fully engaged in the upper hive body, and one frame was filled almost entirely with eggs. So that’s good. The brood wasn’t very strong in the lower hive body, but the bees still seem to be moving storage up, so I’ll give it another week before I start to worry. They still seem to have a good number of workers. North is going gangbusters. They had 12–count them, 12!–frames of capped or started brood, and had almost entirely filled out the top hive body. Saturday night, after working on my book for a while, I finished putting together frames for a super, and on Sunday, our friend John and I added it to North. Honey, ahoy! What amazes me is how the two hives have almost entirely changed places regarding brood-rearing. The workers in South still are bringing in plenty of pollen, so they expect the queen to be laying, I think. If she fails to fill out more brood by the next check this coming weekend, I’m afraid we will have to look at replacing her. One article I read recently recommends this if there’s no brood, just honey and pollen in the brood chamber. That’s not quite the case yet, so I have my fingers crossed.